Bell pepper is a large, crisp, bell-shaped fruit from the pepper family. 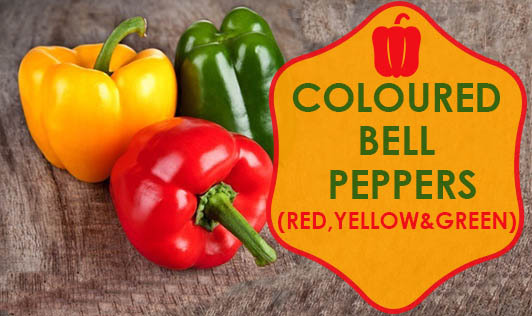 The term "bell pepper" or "pepper" or "capsicum" is often used for any of the large bell-shaped capsicums, regardless of the color. Red capsicums are the sweetest due to their higher sugar content. Orange and yellow capsicums have almost as much sugar as the red variety, while green ones have low sugar content due to early picking. This gives them their slightly bitter taste. Capsicums are one of the most popular salad ingredients in the world. They are also cultivated as ornamental plants in many parts of the globe. Bell peppers are rich sources of Vitamin C. They are also excellent sources of vitamin A. These two vitamins are also very powerful antioxidants that may help reduce the risk of cardiovascular diseases and several cancers. Vitamin C present in capsicum helps in the repair of tissues, and is necessary to form collagen, an important protein used to make skin, tissue, tendons, ligaments, and blood vessels. Vitamin C is also essential for healing and repair of wounds, and the maintenance of bones and teeth. Providing 11% of the daily requirement of vitamin A (for 100g), capsicum assists in forming and maintaining healthy teeth, skeletal and soft tissue, and skin. Vitamin A promotes good vision, especially in low light. It may also be needed for reproduction and breast-feeding. As capsicum is also rich in fiber, it plays an important role in moving roughage through the intestines, decreasing the possibility of constipation and relieving symptoms related to IBS (Irritable Bowel Syndrome). Fiber is also valuable in controlling hunger by giving satiety and in turn facilitating weight loss. Myth: Capsicum causes ulcers in the stomach. Fact: Capsicum cannot cause ulcers in the stomach. Ulcers can be caused due to various other reasons such as bacterial infection or continued use of anti-inflammatory drugs. Myth: Capsicum seeds cause kidney stones. Fact: Capsicum seeds do not cause any kidney stones and on the contrary, the seeds can be a good source of fiber. Select capsicums that are firm and are of uniform color. Avoid capsicums that have dull or wrinkled skin, or spots or blemishes. Capsicum can be served in the raw or cooked form. Sliced capsicums can be used raw in salads, and cooked in kebabs, pizzas, and stir-fries. Powdered capsicum, also known as paprika, can be used in dishes to enhance the color and taste. Capsicum can also be made into a purée after roasting it and added to soups, pasta, and dips.